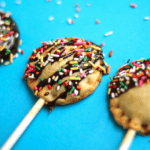 Home » pie » Banana Split Pie Pops! 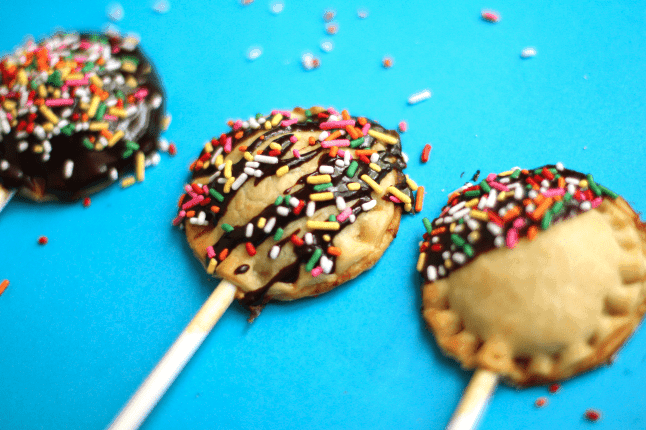 If the word “fun” was ever in the form of a food, it would definitely be these banana split pie pops! I don’t have any kids (yet) but I felt like one creating these and even eating these. These banana split pie pops would be so cool at a children’s birthday party or even when you need to let the kid out inside of you! I’m so glad Pillsbury brought out my childlike imagination with this recipe. They are filled with mashed banana dusted with sugar and cinnamon and then dipped in chocolate sauce and covered with sprinkles! 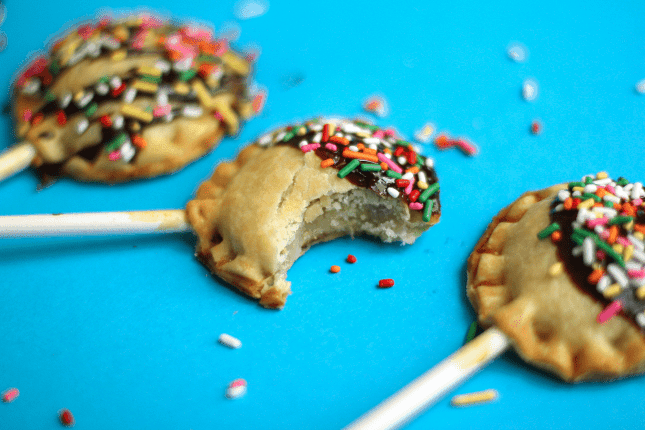 What I love most about these banana split pie pops is the fun doesn’t stop after the pies are baked. You can create some amazing sides to serve along with these like strawberry and pineapple sauces. Or really take the treat literal by adding a dollop of whipped cream, a few nuts and a cherry on top! It will feel just like the banana split you remember having at your local ice cream parlor. Relive the memories with this treat today!! Begin to roll out the pie dough on a floured surface to about 1/8-inch thickness. Using a 2 to 2 1/2 inch round cookie cutter, cut out 16 rounds to make 8 pie pops total. Next, place 8 of the cut rounds on the parchment covered baking sheet. Take a lollipop stick and place in the center of the rounds. Scoop a tablespoon of mashed banana on top of the stick in the direct center of the rounds. Sprinkle the mashed banana with 1/4- 1/2 teaspoon of sugar (depending on how ripe the bananas are) and a pinch of cinnamon. Take the remaining rounds and place them directly over the tops of the banana filling. Taking either a lollipop stick or a fork, seal or "crimp" the edges of the pie dough to seal the pops. Lastly, brush each completed pie pop with the egg wash.
Bake pie pops for approximately 20 minutes. They should be nice and golden brown. While the pops cool, place chocolate chips and milk in a microwave safe bowl and microwave in increments of 15 seconds and stir chocolate mixture in between until all chips are melted and the mixture is a silky chocolate sauce. Now for the really fun part! Dip the front side of each pie pop in the chocolate (feel free to create unique patterns) then cover the chocolate with sprinkles!! Wait to dry and then enjoy these fun treats with your kids!! Fun tip: Serve with whipped cream, strawberry and pineapple sauces and cherries on the side!! Very cute! Glad I came across your blog! I have the pie pop machine but have yet to use it…ha. Happy 4th! Thanks so much for stopping by! And Happy 4th to you. Now its time to get out your pie pop machine! What can be used as a substitute for egg? Hi Amita, you could try brushing the pie pops with milk. instead of chocolate I melted peanut butter chips and had a banana and peanut butter pop! Wow that was an awesome idea Joyce!!! Same here Jocelyn! Aren’t they so much fun!??? My grandchildren will LOVE these! Love the flavors! TOO cute, Jocelyn!!! Too cute! My niece and nephews would go crazy over these! Hi Jocelyn! I must made these! Looks so easy to make and super cute! 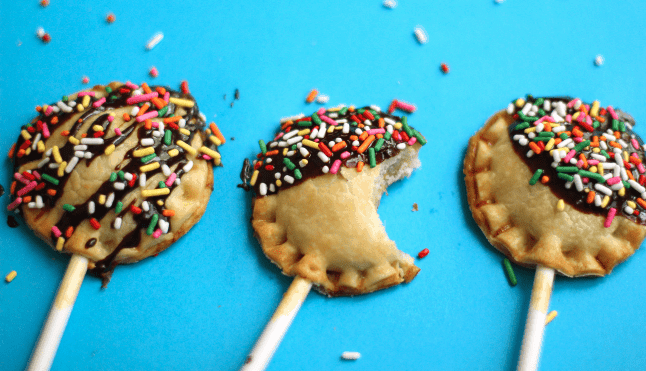 My kids will adore these pie pops for sure. I think this is my first “pie” pop recipe. I’m excited to give it a try very soon. Thanks for sharing the recipe! Aww thanks so much Nami! I think these are definitely perfect to make with kids! what camera do you use?! your pictures are always too amazing, not that it hasnt got anything to do with your lighting skills! Thanks so much Em! I am seriously trying to still learn so much but I use my dad’s Canon 60d. Thanks so much Valerie!! Banana and chocolate is pretty cool together indeed.